Animal Wildlife | Golden Lion Tamarin | The golden lion tamarin is a small monkey native to the eastern rainforests of Brazil. The golden lion tamarin is today considered an endangered species as there are estimated to be around 1,000 golden lion tamarin individuals left in the wild. Golden lion tamarins are best known for their bright fur which (as the name suggests) is golden and orange in colour. The golden lion tamarin is one of the smallest primates in the world with the average golden lion tamarin adult growing to just 20cm tall! 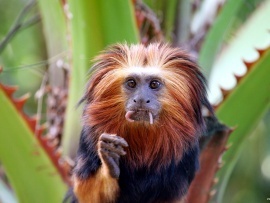 The golden lion tamarin also has an incredibly long tail which is often longer than the golden lion tamarin's body. Despite the long length of the golden lion tamarin's tail, it is not prehensile which means that the golden lion tamarin cannot use it's tail to grab onto trees and hold on. The golden lion tamarin leads and arboreal existence meaning that the golden lion tamarin spends the majority of it's life inhabiting and moving around in the trees. The golden lion tamarin has sharp nails that are almost claw-like in appearance which helps the golden lion tamarin to move around in and climb the trees more easily. The paws and tail of the golden lion tamarin are often slightly black in colour. The golden lion tamarin is an omnivorous animal so the golden lion tamarin feasts on a mixture of plants and animals. The golden lion tamarin eats sweet fruits, berries, leaves, insects and small mammals and reptiles that coexist in the tree tops. Like, many other species of monkey, the golden lion tamarin is a diurnal mammal meaning that it is awake and hunts for food during the day and sleeps during the night. The biggest predators of the golden lion tamarin are nocturnal animals such as snakes, wild cats and rats which can reach the golden lion tamarins in their resting place in the trees. However, golden lion tamarins often sleep in nesting holes or small hollows in the trees which can make it difficult for large nocturnal predators to get to them. Golden lion tamarins live together in groups (known as troops) with each golden lion tamarin troop patrolling their territory which can be as large as 100 acres (400,000 square meters). The golden lion tamarin troop is led by the breeding male and female and fights often occur between golden lion tamarin troops over their territory. Golden lion tamarins usually breed once a year from September to March, although it is known for a female golden lion tamarin to have more than one litter per year. 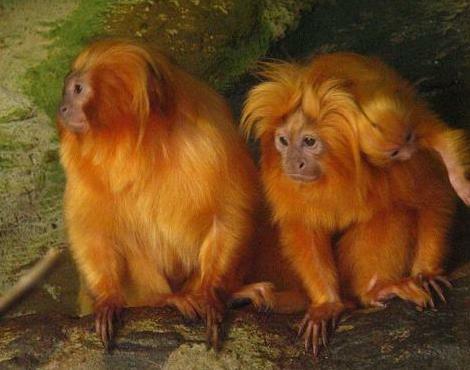 After a gestation period of around 4 months, the female golden lion tamarin will give birth to twins. 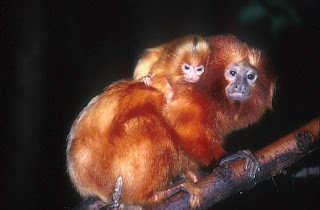 The baby golden lion tamarins are looked after by the mother golden lion tamarin until the baby golden lion tamarins are around 3 months old and are then big enough and strong enough to start looking after themselves. It is known that only 50% of all golden lion tamarin babies are thought to survive their first year of life. 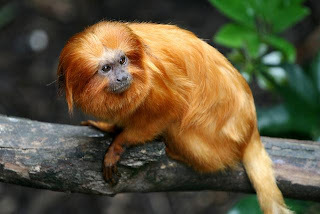 Today the golden lion tamarin is an endangered species, a sad side effect of drastic deforestation within the golden lion tamarin's environment. It is thought that only 2% of the golden lion tamarin's forest habitat is still standing meaning that golden lion tamarin troops are being forced closer together. Today, the majority of the wild golden lion tamarins inhabit a reserve made up of swampy forest close to the Brazilian capital of Rio de Janeiro. 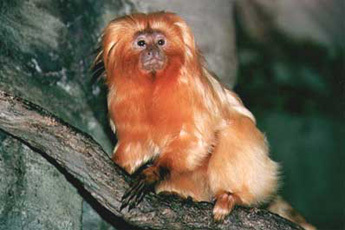 0 Response to "Golden Lion Tamarin"